Many folks come into my shop… and feel compelled to regale me with their life history with firearms. Head-shooting squirrels at 100 yards with a .22 short and iron sights, deer dropped at 500 yards with a .35 Rem, ground hogs taken with one shot across vast distances, etc. — and it would appear that every former SEAL, Marine or SF sniper lives in the general area. My Dad used to tell me that sometimes you just have to smile and nod a lot. Not always, but a lot. By the way, if you want your own jumbo dime, Amazon.com offers 3″-diameter Roosevelt dimes for about five bucks. These would be good for range accuracy challenges. You could tell a buddy you can “put five shots on a dime at 200 yards”. Then whip out this slightly oversize 3-incher and see his face. 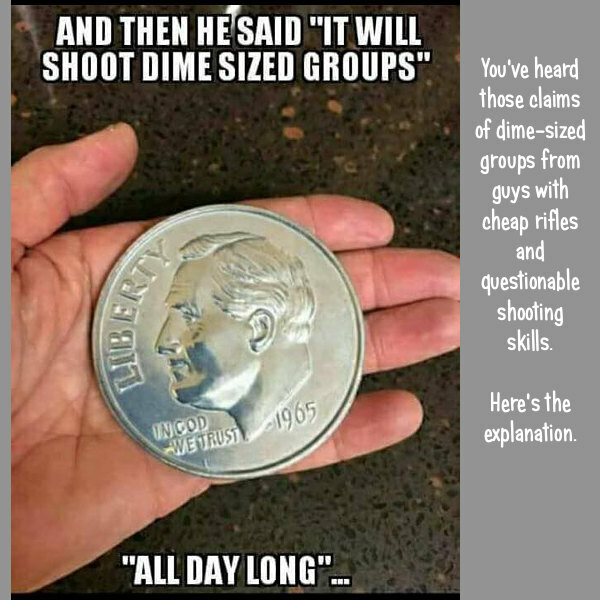 These could also serve as “gag prizes” at club shooting matches — giveaways for folks who want to say they shot a group at 200 or 300 yards that could be “covered with a dime” … a 3″ dime that is! Share the post "Dime-Sized Groups All Day Long — Yeah, Right…"
Nosler Factory Seconds are now available at Midsouth Shooters Supply. These bullets are completely functional (with correct weights and dimensions), with only minor cosmetic blemishes. You’ll find slight tip discolorations, water spots, and little else. The Accubond and Ballistic Tip bullets will work great for hunting — your prey won’t care about the water spots. And the RDF match bullets can definitely do the job for Service Rifle matches (70gr .224) or F-TR events (175gr .308). Getting match-grade, 30-Cal 175-grainers for $21.49 is a total steal. But you need to act soon — quantities are limited and these factory seconds blems always go fast. Once they are gone, they’re GONE! 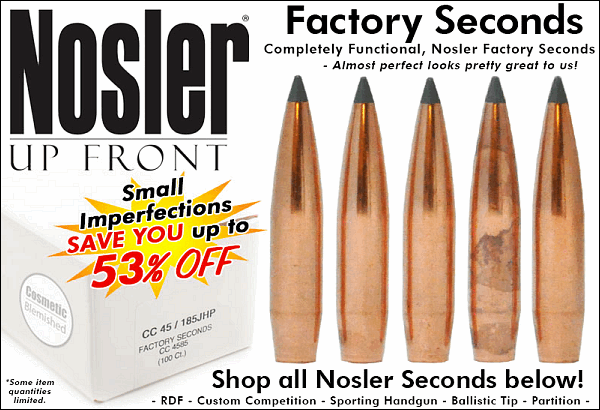 Share the post "Great Pricing on Nosler Blem Bullets — Up to 53% Off"